Siam color. Perfumed aromas of ripe wild strawberry, orange zest, and magnolia with a round, spritzy, moderately sweet light-to-medium body and an effortless, interesting, medium-length huckleberries in creme finish with no oak flavor. A very friendly and juicy sweet red spritzer that will be a divine alternative to Lambrusco or Brachetto. Bottom Line: A very friendly and juicy sweet red spritzer that will be a divine alternative to Lambrusco or Brachetto. 88 • Alain de la Treille 2015 Pinot Noir, France 12.5% (France) $11.99. 90 • Albada 2014 Garnacha, Calatayud 14.5% (Spain) $13.99. 92 • Albada 2015 Macabeo, Calatayud 14% (Spain) $12.99. 92 • Balius 2014 Reserve Block, Cabernet Sauvignon, Rutherford, Napa Valley 14.5% (USA) $35.00. 89 • Bydand 2015 Cabernet Sauvignon, Napa Valley 14.8% (USA) $75.00. 89 • Chakana Estate 2014 Estate Selection, Malbec, Mendoza 14% (Argentina) $26.95. 93 • Chakana Estate 2014 Estate Selection Red Blend, Mendoza 14.5% (Argentina) $26.95. 85 • Chateau Gravas 2015 Sauternes 13.5% (France) $39.95. 88 • Codirosso 2014 Chianti DOCG 12.5% (Italy) $12.99. 88 • Cortenova 2015 Pinot Grigio, Italy 12% (Italy) $8.99. 92 • Ferraris 2017 Dulcis in Fundo, Malvasia di Casorzo 5.52% (Italy) $17.99. 89 • Jip Jip Rocks 2015 Shiraz, Padthaway 14.5% (Australia) $19.00. 86 • Jip Jip Rocks 2015 Shiraz-Cabernet, Padthaway 14.5% (Australia) $19.00. 89 • Jip Jip Rocks 2016 Chardonnay, Padthaway 13% (Australia) $19.00. 86 • Jip Jip Rocks 2016 Sauvignon Blanc, Padthaway 13% (Australia) $19.00. 88 • Jip Jip Rocks 2016 Estate Grown, Shiraz, Padthaway 14.5% (Australia) $19.00. 93 • Jip Jip Rocks 2016 Estate Grown, Shiraz-Cabernet, Padthaway 14.5% (Australia) $19.00. 91 • Jip Jip Rocks 2016 Shiraz, Padthaway 14.5% (Australia) $19.00. 90 • Kinsella Estates 2015 Heirloom Vineyard, Cabernet Sauvignon, Dry Creek Valley 14.7% (USA) $130.00. 92 • La Salette 2015 Blanc, Cotes de Gascogne 12% (France) $9.99. 88 • Maipe 2015 Malbec, Mendoza 14% (Argentina) $12.99. 83 • Maipe 2015 Reserve, Bonarda, Mendoza 13.5% (Argentina) $18.99. 84 • Maipe 2014 Reserve, Cabernet Sauvignon, Mendoza 14.5% (Argentina) $18.99. 87 • Maipe 2015 Malbec, Mendoza 13.5% (Argentina) $12.99. 81 • Maipe 2016 Malbec Rosé, Mendoza 12% (Argentina) $12.99. 89 • Maipe 2014 Reserve, Malbec, Mendoza 14.5% (Argentina) $18.99. 88 • Maipe 2016 Torrontes, Argentina 14% (Argentina) $12.99. 88 • Mt. Monster 2015 Shiraz, Limestone Coast 14.5% (Australia) $14.00. 90 • Mt. Monster 2015 Cabernet Sauvignon, Limestone Coast 14.5% (Australia) $14.00. 88 • Mt. Monster 2016 Chardonnay, Limestone Coast 13% (Australia) $14.00. 88 • Mt. Monster 2016 Sauvignon Blanc, Limestone Coast 13% (Australia) $14.00. 88 • Mt. Monster 2016 Shiraz, Limestone Coast 14.5% (Australia) $15.00. 86 • Mt. Monster 2016 Cabernet Sauvignon, Limestone Coast 14.5% (Australia) $15.00. 88 • Mt. Monster 2017 Sauvignon Blanc, Limestone Coast 11.5% (Australia) $15.00. 91 • Mt. Monster 2017 Shiraz, Limestone Coast 14.5% (Australia) $15.00. 86 • Mt. Monster 2017 Cabernet Sauvignon, Limestone Coast 14.5% (Australia) $15.00. 85 • Mt. Monster 2017 Chardonnay, Limestone Coast 13% (Australia) $15.00. 92 • Mt. Monster 2016 Shiraz, Limestone Coast 14.5% (Australia) $15.00. 88 • Mt. Monster 2016 Cabernet Sauvignon, Limestone Coast 14.5% (Australia) $15.00. 91 • Mt. Monster 2017 Cabernet Sauvignon, Limestone Coast 14.5% (Australia) $15.00. 86 • Nuna 2015 Reserve, Bonarda, Mendoza 13.5% (Argentina) $16.99. 88 • Nuna 2015 Reserve, Malbec, Mendoza 14% (Argentina) $16.99. 93 • Paradigm 2013 Cabernet Sauvignon, Oakville, Napa Valley 14.5% (USA) $84.00. 91 • Paradigm 2014 Cabernet Sauvignon, Oakville, Napa Valley 14.6% (USA) $84.00. 91 • Prime Brume 2015 Soave 12% (Italy) $8.99. 88 • Riebeek Cellars 2015 Cabernet Sauvignon, Swartland 14% (South Africa) $11.99. 84 • Riebeek Cellars 2015 Chardonnay, Swartland 14% (South Africa) $9.99. 86 • Riebeek Cellars NV Cape Ruby Fortified Wine, Swartland 20.5% (South Africa) $22.00. 87 • Romariz NV Reserva Latina Tawny Port, Douro 20% (Portugal) $18.99. 93 • Rubus 2014 Shiraz, Barossa Valley 14.5% (Australia) $18.99. 84 • Rubus 2015 Cabernet Sauvignon, California 13.5% (USA) $15.99. 89 • Rubus 2012 Cabernet Sauvignon, Napa Valley 13.9% (USA) $26.99. 85 • Rubus 2015 Chardonnay, Colchagua Valley 13.5% (Chile) $14.99. 84 • Rubus 2014 "Icon", Malbec, Mendoza 14% (Argentina) $19.99. 86 • Rubus 2014 Old Vines, Zinfandel, Lodi 14.6% (USA) $12.99. 90 • Rubus 2013 The Terraces Collection, Pinot Noir, Waipara Valley 13.5% (New Zealand) $36.95. 87 • Rubus 2015 Sauvignon Blanc, Waipara Valley 12% (New Zealand) $16.99. 85 • Rubus 2014 Proprietary Reserve Red, Australia 13.5% (Australia) $12.99. 82 • Rubus 2015 White Blend, France 12% (France) $9.99. 87 • Siegel 2014 "1234" Reserva Red Blend , Colchagua Valley 14% (Chile) $14.99. 93 • The Bryson 2010 Barrel Select Red Blend, Padthaway 14.5% (Australia) $49.00. 88 • Tres Ojos 2012 Garnacha, Calatayud 14.5% (Spain) $8.99. 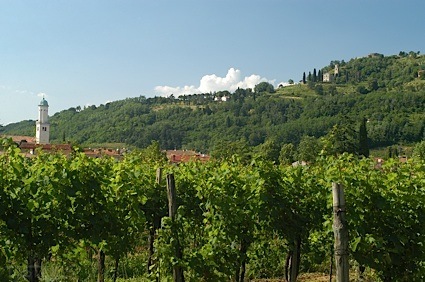 The most common dessert wines in Piedmont are slightly sparkling wines known as frizzante. The two most common are Moscato d'Asti and Braccheto d'Acqui. The former, made from the Moscato variety, has exotic aromas of orange blossom, peach and ginger and has a light sweetness with only 5.5% alcohol. The later, made from the Brachetto variety, is sort of the red counterpart of Moscato d'Asti. It has delicate flavors of strawberry and red cherry with notes od red flowers and has a touch of sweetness on the finish. It too has very low alcohol, checking in around 6%. These wines are meant for drinking within their first or second years and pair best with fresh fruit. There are a handful of producers that also make a passito version of Moscato and Brachetto; these are richer on the palate with higher alcohol (12%; the Moscato passito in general is quite lush and is a tantalizing dessert wine with pastries and aged cheeses. 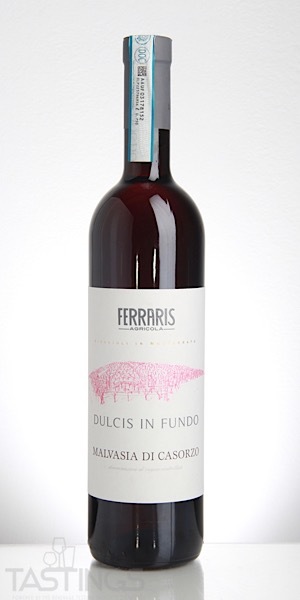 Ferraris 2017 Dulcis in Fundo, Malvasia di Casorzo rating was calculated by tastings.com to be 92 points out of 100 on 12/11/2018. Please note that MSRP may have changed since the date of our review.